How-I-became-a-billionaire stories are intriguing. They typically involve recognition of market opportunities and willingness to take large risks along with disregard for popular opinion about their business practices and investing philosophies. I knew that Warren Buffett was a value investor, but it never occurred to me that so many other billionaires share this philosophy. For example, Graeme Hart, Suleiman Kerimov, and Seth Klarman also invest in distressed and unpopular companies. These investors aren't afraid of borrowing money or orchestrating business acquisitions through financial leverage. For example, Eli Broad co-founded homebuilder Kaufman & Broad (now KB Home) with a $25,000 loan from his in-laws. Similarly, Harold Simmons bought his first drug store with $5,000 in cash and a $95,000 loan, and later employed leveraged buyouts (LBOs) to buy undervalued businesses. Ira Rennert issued junk bonds to acquire struggling companies. Many billionaires make their initial fortunes in one or two major investments. They typically spend their early careers focused on developing a single business or type of investment. For example, Simmons spent 13 years building his drugstore chain, which he sold to Eckerd Corporation for $50 million in 1973. Philip Anschutz accumulated wealth from oil-producing land that he purchased near the Utah-Wyoming border. Albert Frere amassed substantial holdings in Belgium's steel industry before launching an investment company. Peter Lim's investment in Wilmar, a palm oil company, was the source of his initial fortune. Most self-made investment billionaires studied or worked in financial realms. College courses taught them business basics, and first jobs provided insights into real-life financial practices. These foundations of knowledge later informed their investment philosophies and strategies. Buffett learned value investing from Benjamin Graham, who is considered the author of this approach. Kerimov and Lim both studied accounting, and Hart began forming the concept of his business while completing his MBA. Both Lim and Buffett held jobs as stockbrokers, while Simmons worked as a bank examiner and banker. Many billionaires begin the process of building wealth in their 20s and 30s or earlier. Billionaires suffer occasional losses. But instead of withdrawing from the world's markets, they continue investing. An extreme example is Kerimov. He lost billions after selling his Russian assets to buy shares of Morgan Stanley, Goldman Sachs, Deutsche Bank, and Credit Suisse in 2008, the year of a global financial crisis. To rebuild his wealth, he borrowed to invest in mining, real estate, and telecommunications. As of March 2013, his net worth is $7.5 billion. Billionaires may get rich from one or two sources, but they diversify their assets after becoming wealthy. Many establish holding companies for a broad base of investment activities while others make acquisitions in more limited spheres. Just as Buffett established Berkshire Hathaway as a holding company for a diverse portfolio of investments, Rennert started Renco Group; Hart, Rank Group; and Simmons, Valhi. Some still focus on a few key areas but are more broadly diversified than before. For example, Anschutz owns Xanterra, which provides hospitality services in national parks, and AEG, a sports and entertainment group that manages concert venues, musical artists, and more. 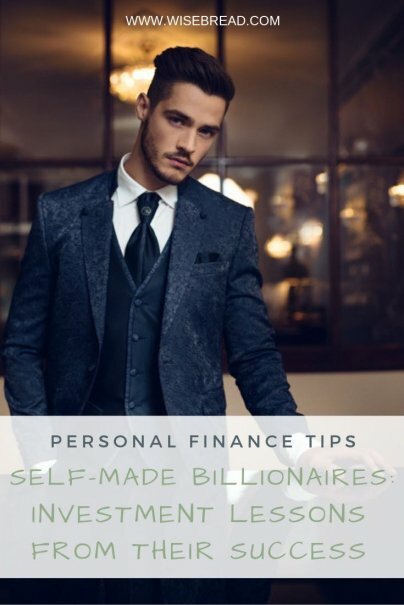 Learn more about specific investments for certain billionaires through iBillionaire (an iPhone app) and Forbes' real-time tracking of publicly held investments. What can a regular investor learn from these success stories? Start building wealth with your first paycheck, whether earned from a side business or first job. Don't be afraid to take risks, especially if you are young and have years to recover your wealth, but structure your finances so you'll always have cash flow to service debt. Pursue opportunities for high returns, noticing that these may come from business deals requiring hands-on involvement as well as strong financial and operations leadership, not just typical investments on the open market. Learn the basics of finance in order to evaluate opportunities and manage your portfolio. Note that you have a limited capacity for monitoring your investments so choose wisely (buying stock on low valuations). Don't fret over setbacks; apply lessons learned on the next investment. Diversify as you accumulate wealth to protect from severe and sudden losses. Finally, whether or not adopted by the masses or endorsed by the experts, if your investment approach delivers results over the long-term, stay the course. What billionaire investors have you drawn investment inspiration from? Great article. I need to work on taking on more financial risks. It sounds like a lot of these guys bet it all on a couple of deals and it ended up working out. I wonder how many others there are that bet big and lost it all? We don't hear as much about those who made big bets and lost everything, esp. on the Forbes list though Kerimov's story was interesting to me as he lost big and then recovered. But as I think you have surmised that is part of the point: though there are many who take measured risks (especially those who buy at low valuations) and succeed, getting rich often involves taking large risks and making big moves. Most of these folks studied the market, economy, legislation, etc. first and then moved, rather than jumping in with little study or analysis.